The BioSeal Team Training System was designed in close collaboration with the California Emergency Management Agency to help execute its mass fatality disaster preparedness plans. 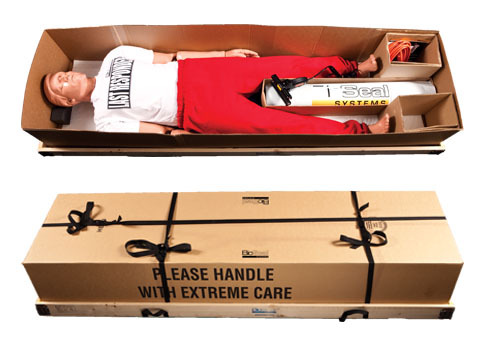 It includes a life–sized, fully–articulated Simulaids rescue dummy — the same kind used in firefighter training — to simulate an authentic experience. This hands–on training provides your team with a true–to–life understanding of just how difficult it is to maneuver a dead body, but also how easy it is to use the BioSeal System containment technology. "The rescue dummy really is the keystone to the training system. The BioSeal Systems team understood that and worked with us to create a solution that would provide a quality training experience so that our first responders will be able to get the job done in a real–life situation."